Note: This model only available in 208-240 volt single phase. Mid-frequency induction heaters are the simplest in terms of design and implementation. With their low cost of ownership and maintenance, they are the most popular and reliable machines. The 15kW models are especially popular for their large power capacity and small footprint at an affordable price. 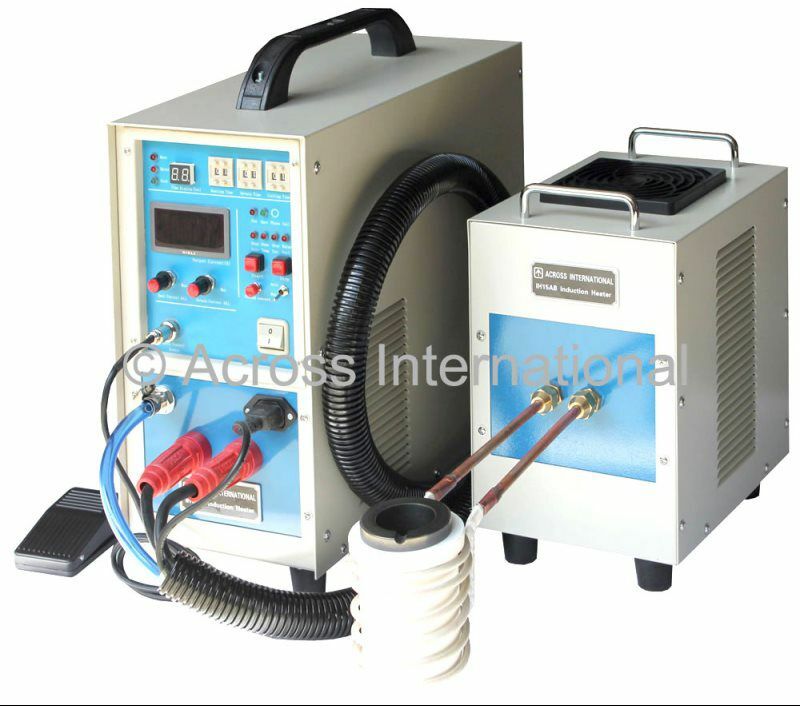 This makes them standard equipment for many factories, labs and workshops where 230V AC is available. Overvoltage protection: machine shuts down when input voltage is over 245V. Overvoltage light will turn on and buzzer will sound continuously. Alarm and light shut off automatically when voltage goes below 245V. Do NOT use single-turn coil if coil diameter is smaller than 4 inches, it will cause high frequency damage to the machine. 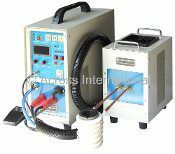 Dual-station with connection cables and hose let you separate the heater and controller up to seven feet, allow you to stay away from high temperature, dirty and corrosive environment and for a safer operation, or if you need to move the heater to your work pieces constantly during operation. Ease of use: just plug in the power and connect the water cooling system. Our simple instruction allows you to use the heater in 15 minutes. Light weight, portable (with built-in handle), instant heat and up to 90% energy savings. Custom coil design (fixed coil or coil on a cable so it can be used by hand like a wand). Always wear protective gear and goggles when operating the machine. Crucibles must be covered all the time during operation. Across International is not responsible for any injury or damage caused by misuse. Note: This model only available in 460-480 volt three phase. Light weight (only 60 Lb), portable (with built-in handle), instant heat and up to 90% energy savings. We provide sample testing and custom made coils in our New Jersey facility. Overvoltage protection: machine shuts down when input voltage is over 495V. Overvoltage light will turn on and buzzer will sound continuously. Alarm and light shut off automatically when voltage goes below 495V. Light weight, portable (with built-in handles), instant heat and up to 90% energy savings. Precise control with digital output, frequency and current displays. Light weight, portable, instant heat and up to 90% energy savings. Optional graphite, MgO and SiO2 crucibles available. (melting material decides crucible type, weight and size of the material decide crucible size). Mid-frequency induction heaters are the simplest in terms of design and implementation. With their low cost of ownership and maintenance, they are the most popular and reliable machines. Across International IH8M series mid-frequency induction furnaces are designed to operate between 30 and 80 kHz, they are great for precious metals melting and casting at an ultra fast speed (3-5 minutes). Designed for ultra fast melting (normally in 3-5 minutes). Precise control with digital current displays. Graphite crucible with jacket included for immediate use. We provide sample melting test in our New Jersey facility. Circulating water must be pure, clean and below 113°F (45°C). Note: This model is only available in 460-480 volt three phase. 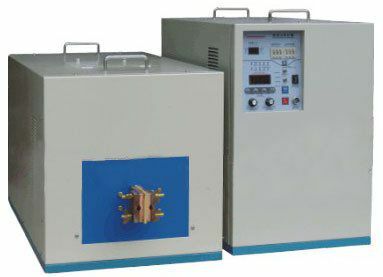 Mid-frequency induction heaters are the simplest in terms of design and implementation. 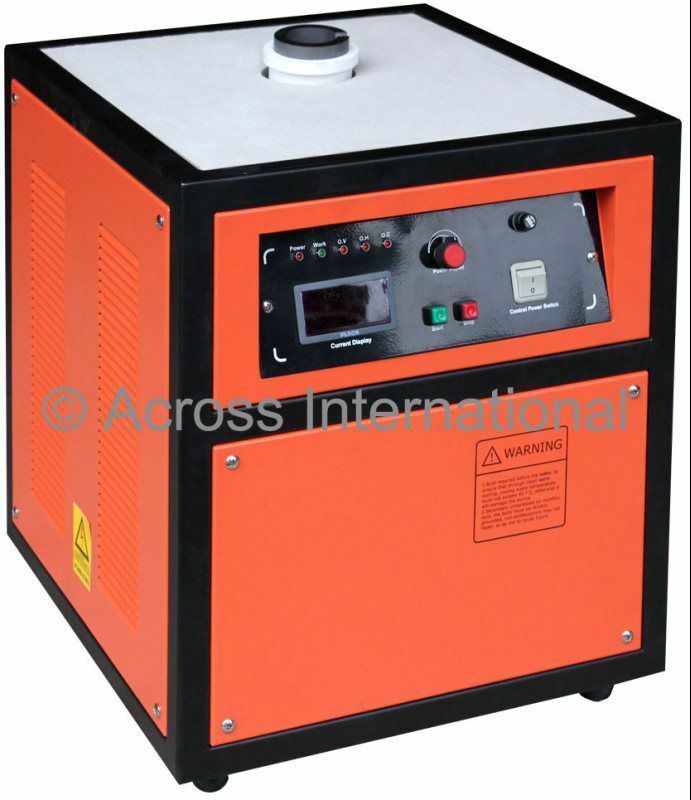 With their low cost of ownership and maintenance, they are the most popular and reliable machines. Across International IH16M series mid-frequency induction furnaces are designed to operate between 30 and 80 kHz, they are great for precious metals melting and casting at an ultra fast speed (3-5 minutes)..